The mission of The Nature Conservancy (TNC) is to preserve plants and animals and natural communities that represent the diversity of life on Earth by protecting the lands and waters they need to survive. The mission of Trout Unlimited/Rocky Mountain Flycasters (TU/RMF) is to conserve, protect and restore North America’s trout and salmon fisheries and their watersheds. Click to see larger image. Both of these organizations achieve their mission by engaging communities effectively through conservation and education programs and partnerships. Along Colorado’s northern Front Range, about 30 miles north of Fort Collins, lies an area of rolling foothills, jagged canyons and sprawling grasslands. This place is known as the Laramie Foothills. It is a region of diverse geology—a place where the plains and the foothills come together. It is a fertile place, rich in human history and host to an incredible diversity of plants, animals and natural communities. The North Fork of the Cache La Poudre River carves its way through the Laramie Foothills, creating the magnificent canyons that are characteristic of this area. These canyons serve as wildlife corridors—links between the plains to the east and the mountains to the west. A long-term public private partnership has worked to conserve over 100,000 acres of important private working lands; connecting them to the upper elevation public lands. The Laramie Foothills has been treasured by generations of people who have worked to maintain its health and natural integrity through a public and private partnership that will help conserve this precious landscape for future generations. 2016 is an exciting year for The Nature Conservancy of Colorado. We are celebrating 50 years of conservation!!! Special events will be offered around the state. 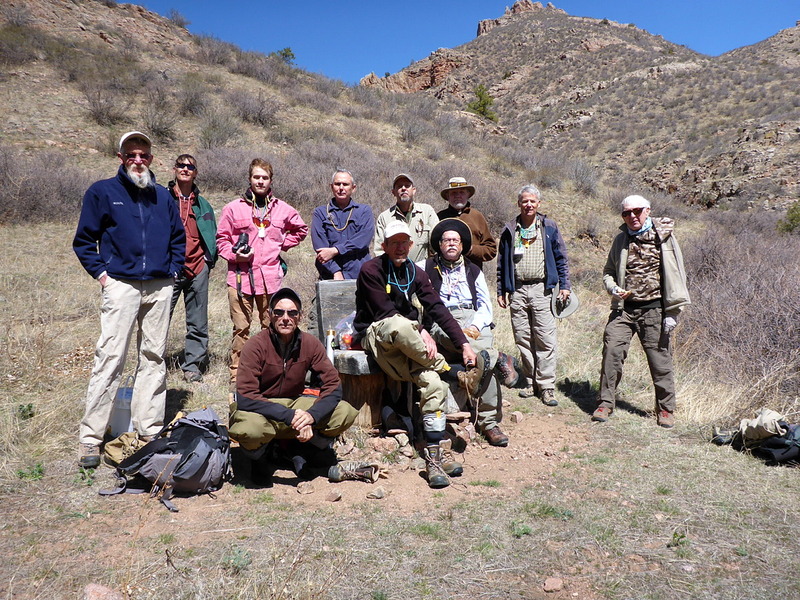 At Phantom Canyon Preserve we will be hosting a 50th Anniversary Volunteer Day on September 17th, 2016. We hope you will join us. Please visit www.nature.org/colorado50 to learn about our 50th Anniversary and to search for events and volunteer opportunities. April 10 Sunday 9:00 a.m.-4:00 p.m.Training with TNC staff. July 31, Sunday: 7:30 a.m.–6:30 p.m. August 7, Sunday: 7:30 a.m.-6:30 p.m.
August 21, Sunday: 7:30 a.m.–6:30 p.m. August 28, Sunday: 7:30 a.m.-6:30 p.m.
*In case of inclement weather or abnormal river flows, back-up day will be used. 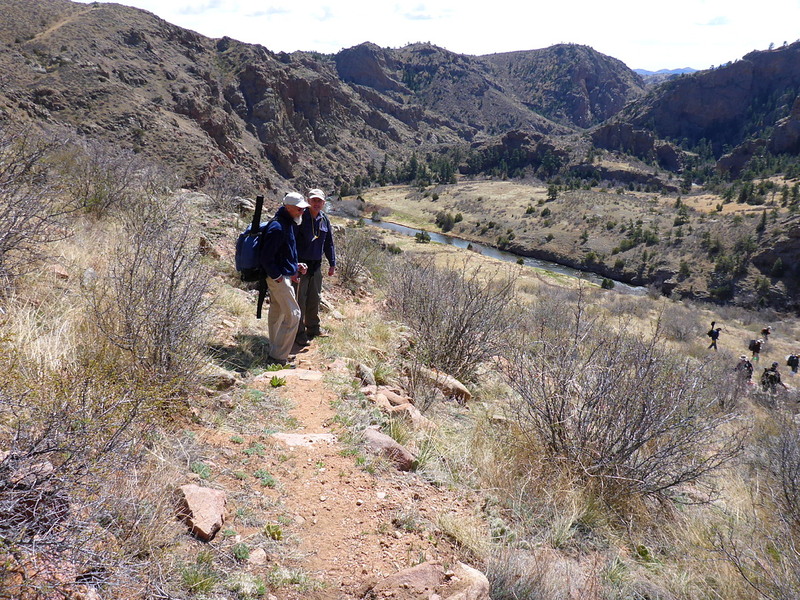 Training Crew April 2015 Help us ensure the 4 miles of River Trail along the North Fork of the Poudre River provide safe and easy access for visitors to Phantom Canyon Preserve. Trained Trout Unlimited River Trail Leaders will work with a team of volunteers to mow vegetation in the trail using gas-powered weed trimmers or hand tools, trim back trail-side vegetation using pruners and hand saws, and rebuild rock cairns marking safe river crossings. Volunteers must be physically able to wet wade multiple river crossings up and down 4 miles of the river, use the equipment safely and hike back up out of the canyon at the end of the day-gaining 600 feet of elevation in less than a mile. Connor Murphy shows us the first fish. As a reward for completing this strenuous work, participants will be allowed to catch-and-release fish during the latter part of the day. Bring weed whackers, long-handled pruners/shears, closed river shoes and change of dry clothing for river trail work. Long pants, long sleeves, leather work gloves and sturdy closed work boots are a must. Be aware of poison ivy along the trail. Bring water, sack lunch, a change of dry clothes, hand tools (if you have them) and pre-cleaned fishing gear. Limit 10 participants per day plus 2 TU leaders. Signup through email is available now. To sign up, potential volunteers should email with your name, phone number, mobile phone number, and mailing address. Those interested in the Phantom Canyon Preserve and the Nature Concervancy can also request a newsletter be emailed to them with details. Additional information will also be posted at www.nature.org/colorado. 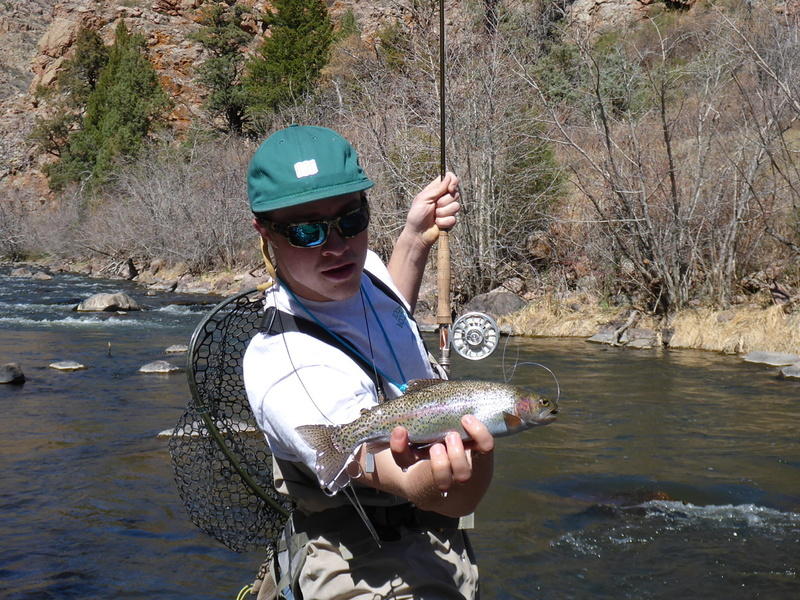 For almost two decades, TU members and TNC staff have cooperated in a combination of recreational, educational, and stewardship activities involving the trout fishery on the North Fork of the Poudre within the Phantom Canyon Preserve. In the early years, the recreational component was a few days of catch and release fishing open to the public with fishing guidance provided by TU volunteers. The stewardship component was TU volunteer labor to maintain approximately 6 miles of primitive foot trail along the river. In 2007, with the intent of better aligning the missions of both TNC and TU, the public fishing program was modified to include a component of conservation education along with the fishing experience. The revised public fishing program was named River Adventure Days. The stewardship program continued as before. This is a challenging year economically and so we ask for your patience and understanding as the River Adventure Days, along with the other TNC outreach programs, have been adjusted to comport with the reduced capacity of the Nature Conservancy staff resources to continue TNC’s commitment to the highest priority conservation work. Dependent on the final plans for Trail/Fishing days in 2010, it appears there will be a similar or perhaps greater number of angler-half-days available to TU volunteers in 2010. Thus, TNC is making every feasible effort to provide the opportunity for TU volunteers to fish at Phantom Canyon, whereas there are other programs not involving TU which have been completely removed from the 2010 list. Looking further ahead, some sections of the river trail will need some realignment and erosion control in the next few years, so it is expected that this will provide additional Trail/Fishing days in future years. For more information feel free to contact Scott Baily or Guy Turenne with our message form. The first part of the day, participants will be divided into two groups; one to work upstream on the river trail the other downstream. Trained leaders will supervise the trail maintenance work. You will be using gas powered weed trimmers to clear the trail of grasses and forbs, hand pruners and saws to prune overhanging shrubs and branches along the sides of the trail and rebuilding rock cairns marking the trail and river crossings. You will be hiking through rocky areas with low brush, poison ivy, nettles, cactus and possibly rattlesnakes, and also wading in and out of the river multiple times. After the trail work is completed, participants will have the opportunity to fish the north fork of the Poudre River and will be distributed throughout the designated river reaches, 2 people per reach, for catch-and-release fly fishing with barbless hooks. There will be a limit of 10 participants plus two leaders for each scheduled trail maintenance day. Leader training is scheduled a week or two before trail maintenance days. Participants must stay the entire day. The work day begins at the gate off U.S. Highway 287 and will run from 7:30 a.m. to roughly 6:30 p.m.
You can contact Scott Baily or Guy Turenne with our message form. RMF has been doing trail maintenance for some time. Other reports can be found on the Phantom Trail page.